Brett Favre holds the record for most wins and for most consecutive starts by a starting quarterback. This is a list of starting quarterbacks in the National Football League updated through Week 11 of the 2016 NFL season. Tom Brady holds the record for most wins by a starting NFL quarterback with 201, a record formerly held by Peyton Manning. Manning is tied with Favre for the most regular season wins by an NFL quarterback, with 186. 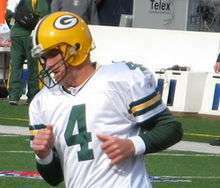 Favre also holds the record for most consecutive starts by an NFL quarterback. From September 27, 1992, to December 5, 2010, Favre started a total of 297 regular season games and 24 playoff games, totaling 321 consecutive games. The longest active streak of consecutive starts is held by New York Giants quarterback Eli Manning at 179 starts, with his first start coming on November 21, 2004. The players listed here are the most recent starting quarterbacks in a regular season game for each team. ↑ "Brett Favre Statistics". Pro Football Reference.com. Retrieved 2009-09-14. ↑ "Peyton Manning Statistics". Pro Football Reference.com. Retrieved 2009-09-14. ↑ "Brett Favre - Game Logs". NFL.com. Retrieved 2010-12-14. ↑ "Eli Manning - Profile". NFL.com. Retrieved 2009-09-14. 1 2 "Atlanta Falcons at New York Giants - 2004 Week 11". National Football League. November 21, 2004. Retrieved August 8, 2012. ↑ Odegard, Kyle. "Cardinals Ready To Start Rolling". azcardinals.com. Retrieved 18 October 2016. ↑ "Atlanta Falcons at New York Jets - 2009 Week 15". National Football League. December 20, 2009. Retrieved August 8, 2012. ↑ Patra, Kevin (August 31, 2015). Tyrod Taylor named Bills' starting QB. NFL.com. Retrieved August 31, 2015. ↑ Shook, Nick. "Dak Prescott: I prepared as the starter 'to begin with'". NFL.com. Retrieved 4 October 2016. ↑ Mason, Andrew. "Trevor Siemian will be the Broncos' starting quarterback". DenverBroncos.com. Retrieved 4 October 2016. ↑ "Detroit Lions at Tampa Bay Buccaneers - 2011 Week 1". National Football League. September 11, 2011. Retrieved August 8, 2012. ↑ "Green Bay Packers at Chicago Bears - 2013 week 17". National Football League. December 29, 2013. Retrieved December 29, 2012. ↑ "Jacksonville Jaguars at San Diego Chargers - 2014 Week 4". National Football League. September 28, 2014. Retrieved October 1, 2014. ↑ "No Doubt Alex Smith is Chiefs #1". August 25, 2015. Retrieved September 4, 2015. ↑ Lankford, Austin (December 12, 2015). "Rams Look to Bounce Back vs. Lions". National Football League. Retrieved December 13, 2015. ↑ "Miami Dolphins at Houston Texans - 2012 Week 1". National Football League. September 5, 2012. Retrieved September 5, 2012. ↑ Orr, Conor. "Sam Bradford will start for Vikings vs. Packers". NFL.com. Retrieved 4 October 2016. ↑ "Saints QB Drew Brees won't play vs. Panthers". National Football League. September 25, 2015. Retrieved September 26, 2015. ↑ "Oakland Raiders at New York Jets - 2014 Week 1". National Football League. September 7, 2014. Retrieved September 8, 2014. ↑ Patra, Kevin. "Carson Wentz named Eagles' starting quarterback". NFL.com. Retrieved 4 October 2016. ↑ "San Diego Chargers at Oakland Raiders - 2006 Week 1". National Football League. September 11, 2006. Retrieved August 8, 2012. ↑ Boren, Cindy. "49ers' Colin Kaepernick will start against Bills". Washington Post. Retrieved 18 October 2016. ↑ "Seattle Seahawks at Arizona Cardinals - 2012 Week 1". National Football League. September 5, 2012. Retrieved September 5, 2012. ↑ "Jameis Winston named Buccaneers' starter...". ESPN.com. July 31, 2015. , cited in "Buccaneers name Jameis Winston...". SB Nation. July 31, 2015. Retrieved September 4, 2015. ↑ "Jay Gruden: Kirk Cousins is Redskins starter for 2015". National Football League. August 31, 2015. Retrieved September 4, 2015.